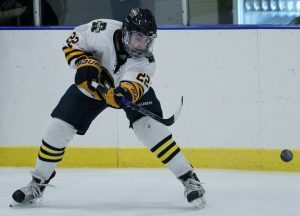 Rochester United wrapped up an undefeated Oakland Activities Association regular season with a 4-2 victory over Lake Orion Thursday night. Led by the line of Grant Peterson, Nick Haddad, and Dylan Ross, the Dragons would have a couple of good chances to tie the game in the third period. “Peterson, Haddad, and Ross really stepped up and had a great game. They were the line out there the last three minutes that had that scoring chance,” Lake Orion head coach Adam Krefski said. But the Rochester United defense held firm, and Streng netted an empty net goal to seal the win with just under one minute to play. 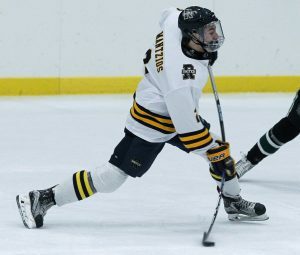 United dominated play territorially, especially in the first two periods, combining a strong forecheck and intelligent play from their defense to keep the pressure on the Dragons and make it hard for Lake Orion to get out of their own end. Still, a big game from Lake Orion goaltender Reid Marshall, who finished with 29 saves, combined with opportunistic scoring, left the Dragons hanging around until the very end. Rochester United also got goals from Michael Zyrek and Niko Mantios as United once again combined balanced offense with great speed and depth, rolling four line all night against Lake Orion. Lake Orion (7-10-1, 4-4) plays Grand Rapids Catholic Central on Saturday and a make-up OAA game against Royal Oak on Sunday.